Dave, Eric. Copyright © 2016, FPP, Inc. All rights reserved. 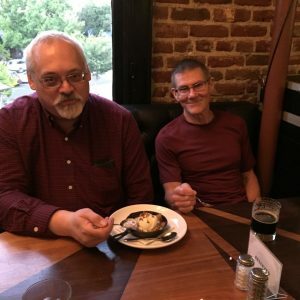 By the time I arrived at The Brickroom for the CocoaHeads August Meeting, after attending the Rogue Hack Lab August Meeting, two people remained and they were eating their dessert. Since I missed the group discussion about Version 3 of the Apple Watch, I’ll submit a link to an article from Fast Company, which should be of interest to anyone who is involved in design, and of special interest to folks who own an Apple Watch.